Not a lot of people decide to get their full degree abroad but I couldn’t imagine my life any other way. As scary as it was moving to a new country all by myself, I convinced my parents to let me go and off I went. The four years it took me to get my BA International flew by and before I knew it was time to think about going home. My time in Ireland had been so wonderful. Not only did I get to experience everything Maynooth and Ireland had to offer, but I now had the opportunity to travel all across Europe. In four years I did more than most people get the opportunity to do in a lifetime. A dozen countries visited (and counting), friends that were more like family, a job I loved, and even a godson! Months of agonizing over my future went by. How could I possibly give this all up? Well, I decided not to! 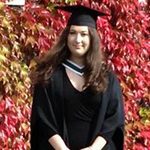 Getting my Master’s degree in Maynooth was probably the best decision I’ve made; I’m not sure why it took me so long to make it! I’m lucky enough to know the ins and outs of Maynooth before my classes even started. There was no stress over finding a place to stay or wondering where I should get the bus. I already know all my lecturers and I even pay less tuition because I received my BA here! 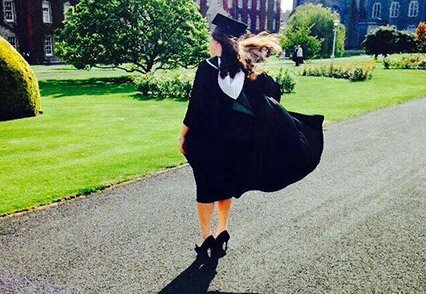 It is hard getting a degree in a foreign country, but Ireland isn’t foreign to me anymore. It’s my second home. That’s not to say I don’t miss the California sun or the Mexican food, but they’ll still be there when I eventually make my way home. But who knows, I might just stick around for my PhD.